A ruptured cervical disc describes an intervertebral irregularity in which the annulus fibrosus fails and allows some of the nucleus pulposus to egress from the normally contained disc structure. In essence, an intervertebral rupture means that the disc has split open and spilled some of its interior contents. Cervical disc ruptures are usually considered to be more serious disc abnormalities than simple bulges or herniations. However, this does not mean that ruptures are inherently more symptomatic than bulges. In fact, there is no evidence supporting the idea the ruptured discs pose any more threat than contained bulging or herniated discs. This discussion delves into the exploration of ruptured intervertebral discs in the neck. We will detail what it means when a disc ruptures, as well as explain the possible consequences of this intervertebral condition. Simple intervertebral bulges and herniations occur commonly throughout the spinal anatomy and are especially prevalent in the middle to lower cervical levels. These are called contained herniations, since although the disc changes shape, the structure remains sound and whole. Ruptures occur when a hole or split opens in the outer disc wall. This tough shell is made up of many layers of fibrous material and is called the annulus fibrosus. The actual rupture in this structure is referred to as an annular tear. Inside the disc resides the nucleus pulposus, a soft moisture-rich core of cushiony material. During a cervical disc rupture, some, or all, of the inner center can leave the disc and migrate outward into the surrounding spinal anatomy. When nucleus material leaks out of a damaged spinal spacer, it is called an extruded disc or an extruded ruptured cervical disc. In some patients, only a small amount of trace proteins escape from the disc nucleus. In many of these cases, the hole in the annulus is small and might even seal-over without any treatment. In other patients, large amounts of nucleus material are ejected, decreasing the size and mass of the spinal disc significantly. Some patients suffer an almost complete loss of nucleus material from a terribly ruptured disc. This makes the remaining intervertebral structure little more than a hollow shell of annulus material. When the leaked nucleus material migrates far enough from its source origin and detaches completely from its parent disc, the condition is called a sequestered disc. Meanwhile, the pieces of nucleus material are referred to as sequestered disc fragments. Ruptures are not inherently painful or pathological. Research shows that ruptures that occur due to trauma, involving spontaneous disc extrusion of an otherwise healthy disc, are very likely to be symptomatic. Meanwhile, ruptures that occur in desiccated or previously damaged discs might not be painful at all, although some may. Generally, the more nucleus material that exists in the disc before it ruptures, the greater the chances of a significant tear causing a symptomatic expression. However, this is not a rule. In fact, in some instances, problematic disc bulges are verified to be placing compressive force against a spinal nerve root or the actual spinal cord. When the disc ruptures, the pressure may be relieved, potentially alleviating the symptoms of neurological impingement. The interior of the disc nucleus contains proteins that can be inflammatory agents to neurological tissue. This is why some patients suffer a condition known as chemical radiculitis when nucleus proteins contact nerve tissues. Since most disc ruptures occur on the posterior side of the disc structure, the ejected nucleus is likely to come into contact with the spinal nerves and/or spinal cord. However, these proteins are not universally irritating, since some patients do not endure any radiculitis symptoms, despite obvious nerve effacement with leaking nucleus material. Doctors are not sure why some patients are more susceptible to chemical nerve irritation than others. In some instances, ejected nucleus material may be pressurized and can compress neurological tissue in much the same manner as a bulging intact disc. However, this event is rare and can often disappear all by itself with time. In worse scenarios, nucleus material may calcify inside the spinal canal, creating possible contributors towards central spinal stenosis or neuroforaminal stenosis. Sometimes, these pieces of nucleus might even damage nerve tissue when they ossify with jagged edges. 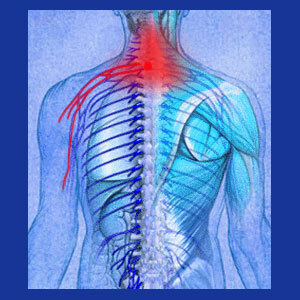 In these extreme instances, spinal cord damage, such as myelomalacia, may result. Intervertebral rupture may or may not be identifiable using x-rays. Most ruptures will image the same way as any degenerated disc, unless the ejected nucleus material has ossified and will therefore be visible as bone. CT scan and MRI evaluation will detail ruptured discs accurately and will also have the best chance of visualizing possible interactions with neurological tissues, such as the nerve roots or spinal cord. All patients with suspected intervertebral pathologies must undergo comprehensive diagnostic imaging prior to beginning any type of treatment. Failure to perform this crucial diagnostic evaluation leaves treatment providers literally guessing at the nature of the disc condition, or whether a disc abnormality exists at all. The universal fact of ruptured cervical discs is that once they lose nucleus material, they will never rehydrate and restore themselves to full form and function again. However, this does not mean that pain will develop, now or ever. If your neck pain has been blamed on a cervical intervertebral rupture, be sure to understand the pathological process involved before seeking treatment. Consult with more than one doctor and get as many opinions to support the validity of the diagnostic theory as possible, especially before succumbing to any invasive care practice, such as discectomy surgery. If the facts do not make sense to you, then do not proceed until you are convinced that this disc is the actual cause of pain. Remember, ruptures do not need to be symptomatic and statistics show most to be rather tame in their pain-generating potential.